While I was reading this post on Techcrunch today, I was wondering about the health of Indian Newspaper Ad Sales compared to that of US, and I was quite surprised with what I found. Indian Newspaper Advertising is not only healthy at present, but is also expected to grow at a decent pace for atleast next 5 years. Here are some of the graphs and reports that would shed some light on what is in store for Newspaper Advertising in India. If you have read the Techcrunch article, the Newspaper Ad sales have been plummeting in USA since 2006, the current being the lowest with negative growth of close to 30%. In contrast, Indian Newspaper Ad sales have been growing constantly over last 5 years. 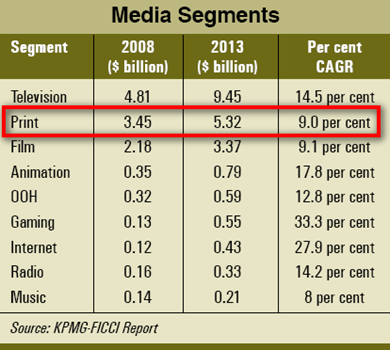 The KPMG-FICCI report puts the growth of Indian print media at a respectable 9% over next 4-5 years. The Print Media Ad sales growth have even better projections. They are estimated to grow at a CAGR of 10% for next 4-5 years ! 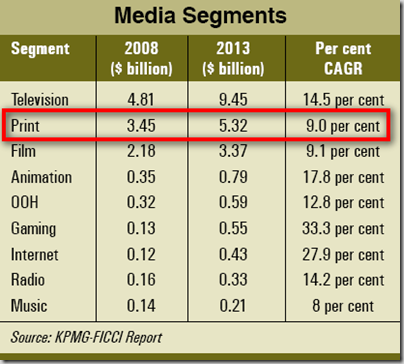 So, all in all – Indian Media – be it print, television or Internet are looking at very robust next 4-5 years. Although, 2009 seems to be a low point in terms of growth- coming years are quite promising. Neta’s of India – The most corrupt lot! Indian Prnint Media Growth vary good & local working in expert's. Yes, in Delhi Hindustan Times has 12,00,000 reader and has grown by 27% from last year…..future of print industry is good because daily readers are growing as education level is gowing up……..
many sites are offering to book advt.for print media online through websites. Please inform me ,due to cost cutting paper offer more discounts. sir, i want to published for a environmental median hindi weekly news paper. I am doing an academic project on newspaper industry and found your posts really helpful. Thanks for the post. While the CAGR of Internet Advertising is 28.1%, the absolute number is still very small. We are talking about a market that is $420million by 2013. I am not sure how this can be a good news. Somehow this sounds like a very bad news. Am i missing something here! i fdon’t know how many of ypou have heard about it but recently a business model innovation from the Times Group got awarded seventh for the most innovative business model of the world. the innovation : called times private treaties (you just have to do a google search on it) is quite innovative way to leverage the learnigs one may accrue from the print demise in west. There were at least 3 foreign colloborations for print editions in India either through the facsimilie edition or a direct edition. A good indication that Indian print media industry holds good for another 5 years. Will it go the US way after 5 years is a big question. Until then we can have our news papers in print. yes, Sriram you are right – and thats one of the reasons why Forbes has launched its print Edition in India (in this recession time) even though the print in on slide worldwide. TOI have reaced a subscription of 5,00,000 in Bangalore alone. That should be some pointer towards the health of Print Media. This is good news for print media in India. However, they should not be complacent and try to get an online presence. TOI, HT etc all have an online presence but they are not really special. The situation is similar to US print media in early 90’s when internet was just picking up in US (as it is in India). They did not believe online media could pose a threat to their business model and look where the are today. I am not sure what the answer is but print media in India will have to innovate if they do not want to suffer the same fate as their US brethren. Abhilash, I agree with you completely…I have written about next 5 years, and I am confident that they will be very healthy as projected in above numbers, but what happens after that is anybody’s guess. Based on what is happening in US right now, I would not be surprised if it does downhill. Having said that, Indian Print Industry has the benefit of seeing what is happening now in the West. They need to innovate to beat the trend.